Let’s take an average day. You arrive home and see your dog. He bounds cheerfully to you, full of wags and wiggles. You are receptive to his goofy and endearing greeting: talking to him, cooing and giving him lots of love. Your dog knows this sequence and expects this greeting and attention when you arrive home. Now, let’s say that on a certain day, your dog gets a little bored and decides to have a treasure hunt while you’re gone. You arrive home to find your chewed shoes strewn about, and Fido sitting in the corner. What do you do? The average owner lets out a big “HUFF,” following it up with a “you’ve been quite the naughty dog,” lecture. Think of the difference between your body language during your lecture and during an average daily greeting or interaction. You are using a different tone of voice, moving erratically, giving very stern looks, and not touching your dog as you normally do. Your dog looks at you and sees and very different individual than he sees on an average day. He knows you are not your typical chirpy-cheery self, and is offering you body language to let you know he’s a bit confused and threatened. He’s trying to calm you and to avoid any further conflict. People, often mistake these very normal body language offering as “guilt.” By doing so, we are making assumptions that the dog is admitting to some wrong-doing and feeling ashamed with getting busted. There’s nothing to prove this though. To assume your dog is making a connection between you being angry with garbage on the floor and his putting it there is actually quite a stretch. Logically think about why a dog would understand that garbage on your floor is wrong. Do you think your dog understands the expense of your flooring, germs, and the value you place on your time cleaning it up? Those are all the things that would make a human feel a sense of wrong doing — or putting someone else out. Assuming your dog can work through a situation like this would mean dogs are capable of higher-order emotions. There is no research to supports this. This video perfectly exemplifies that dogs merely respond to our reaction. There are two dogs in this video. One is guilty, the other is not. Why is the Dalmatian then offering a “guilty” look? Watch the video twice. The Dalmatian slinks toward the camera, offers a stretch — dog calming mechanism), lies down, yawns, licks his lips and offers a head turn. So, was he a conspirator or is he just responding to the owner being upset? The dog who chewed the roll is then targeted, camera comes closer and dog continues to offer soft eye blinks, a drop head. 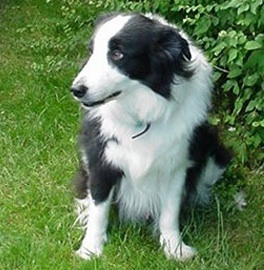 The dog is reacting to the owner challenging body posture and voice, he’s not acting guilty. Let’s make another couple of examples. Let’s say there’s a heap of clothes in your laundry room and you react the same way to this chore. Your dog would likewise offer that very same body language. “Huff! I don’t want to do this laundry! Darn kids, all they do is pile on piece after piece! This house is busier than laundromat! In this case, you are simply talking aloud or commiserating with your dog, but he doesn’t know. He slinks off again. Unless you have an overly fashionable dog, he’s not guilty of the laundry pile. So why would he slink off? Again, he just understands again that something is off kilter. 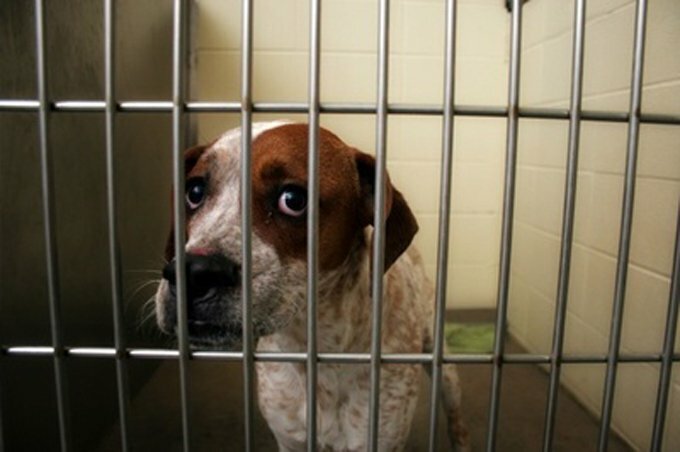 A dog that is frightened in a shelter looks very similar to the (assumed) guilty dog. Do we assume he’s carrying continued guilt from tearing up the couch that landed him in the shelter? Likely sad or scared — not guilty. No. Most (sane) people would simply recognize the dog is offering fearful and confused body language. The dog’s body language is the same as the guilty dog. Why? Because the (assumed) guilty dog is not acting, admitting or feeling guilty, rather he’s feeling nervous, confused and frightened of his human’s gestures. 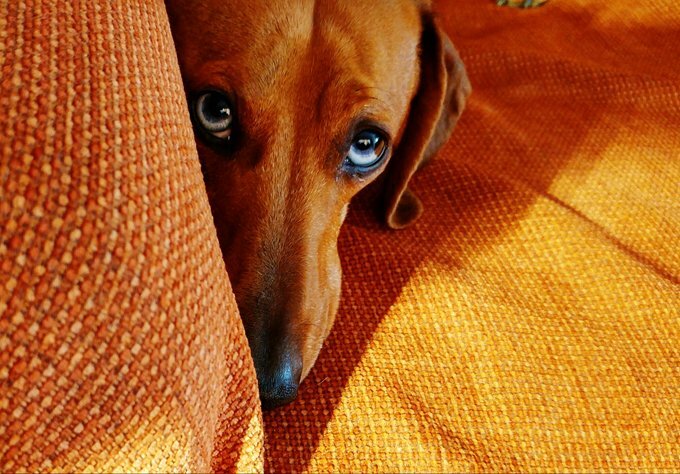 When assuming dog looks guilty, we are merely projecting human feelings onto him by context of the situation. When in actuality, our dogs are reacting to our reaction. We’ve conditioned them to understand our happy-go-lucky postures and greetings as well as our angered and frustrated ones. Research points only that far. In the photo below, is our Border Collie feeling guilty because he dug a hole in the garden or nervous a stranger has entered his territory? 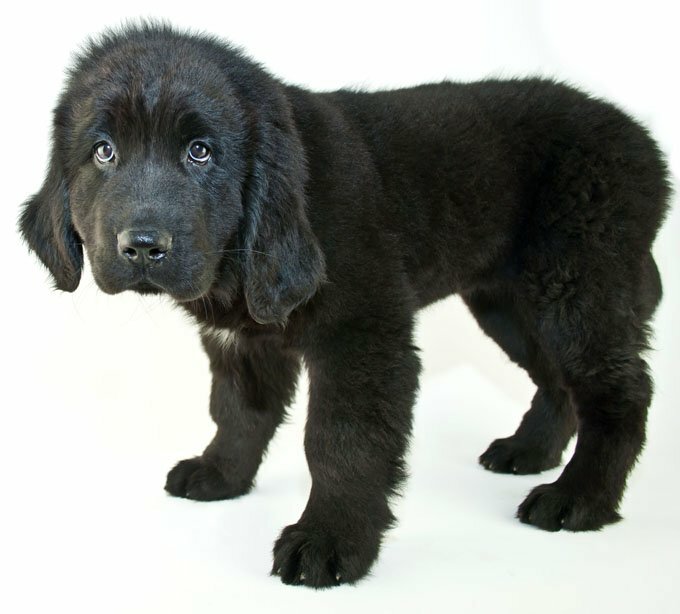 What about this puppy? Is he having second thoughts because he sprinkled on a Persian rug or is there a stranger looming over him about to pet him? So, the next time your dog has a housetraining mistake, tosses your garbage can over, digs a organic dessert from the cat’s litter box and gets caught, just remember he’s not admitting any wrong-doing, or feeling ashamed. He’s simply reacting to your anger or frustration. 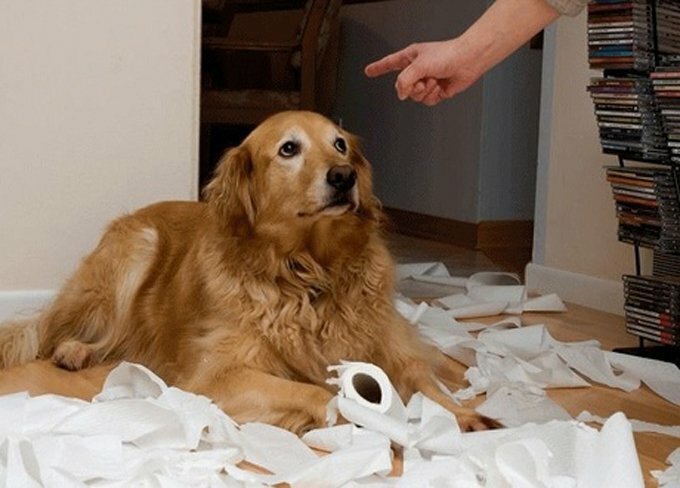 In these cases, the only one who should be reprimanded as “naughty” for chewed shoes, housetraining accidents and the very long list of other doggy domestic mishaps? The person who opted to not crate their unreliable and exploratory dog, leaving him free with household chewing hazards and mistakes. Now who has the guilty look? Looking for more ways to better understand and communicate with your dog? Check out all of Colleen’s DogSpeak columns.